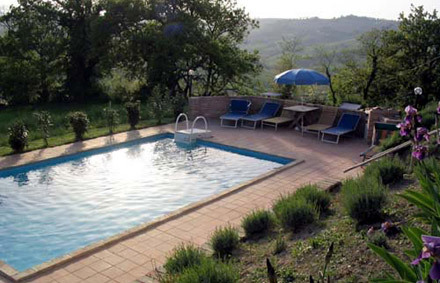 Our Villa in Le Marche, Italy is available for holiday rentals from April to October. The farmhouse, situated in the foothills of the Appenines in the Le Marche region of Italy, can accommodate up to ten people, with four large bedrooms, two bathrooms, an 8 metre swimming pool and both shaded and sun terraces. 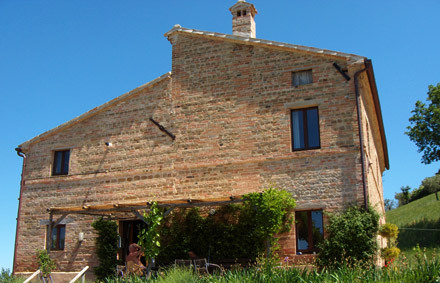 For more information on renting our lovely holiday villa in Le Marche, Italy please contact us directly. The villa is in a fantastic position, with stunning views of the mountains, in a private location just 10 minutes walk from the local village, and 30 minutes drive from the Adriatic beaches. Explore the links below for more information and pictures of our beautiful holiday villa in Le Marche, Italy. Our holiday villa is available for normal rental between the months of April and October, although the villa can be rented on a longer term basis during the winter months- please contact us directly with your specific requirements if this is of interest to you. 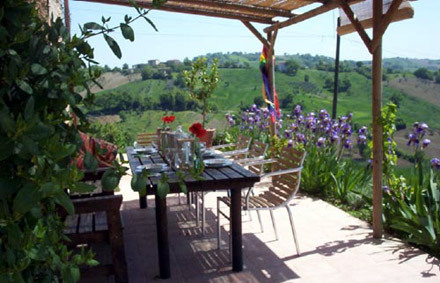 The villa is located about 15 minutes walk from Colmurano, a beautiful hilltop village in the Le Marche region of Italy. The house itself consists of four bedrooms, one of which has an ensuite bathroom with a 100 year old Victorian bath. There is of course an additional main bathroom with bath and shower for those not lucky enough to be occupying the master bedroom! The house has plenty of living space - a large living room as well as a very large kitchen-dining room - although if you rent the house in the summer you are likely to spend most of your time outside, enjoying the amazing views of the Appenine mountains, (particularly beautiful in Le Marche) lazing by the swimming pool, or eating around the large table situated on the upper terrace of the property - it's a truly amazing spot to while away the hours, gazing out into the surrounding valleys of this beautiful area. The local village of Colmurano has loads of character, and everything you need for your stay, including an excellent restaurant, two mini supermarkets, a butcher, a bakery, two bars and a vinery where you can buy the local wine at around six euros for five litres! Just a few minutes drive from the holiday villa is the village of Urbisaglia, and below that the remains of the original ancient settlement of Urbisaglia, which was a thriving city in roman times, with its own coliseum, the remains of which can be visited now. Apparently in Roman times, retiring senior army office officers would be rewarded for their services to the empire with an estate in Urbisaglia. More information on the archeological remains can be seen here. Within 20 minutes drive of the house is the provincial capital of Le Marche, Macerata. Itself a beautiful town, Macerata is best known for its annual Opera Festival during August - the auditorium is outside, and an incredible setting to witness an opera, highly recommended. The villa is about 30 minutes drive from the beaches on the coast of the Adriatic, with some lovely seaside resorts within easy reach. 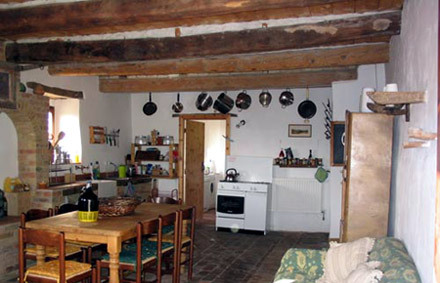 You will all the information you need on the house and surrounding area on the other pages of this site, but if you have any questions at all regarding the house, the area or the practicalities of getting over to this region of Italy, please do not hesitate to contact us. You can see video footage of the exterior of the villa and the stunning views here.